One of the wonders of the modern world is you have access to the rest of the world that even the richest people did not have a few decades ago. Often we either fear or look down upon those from other parts of the world. I like to think I am above all that, but really nobody is. My recent experiences are only a glimpse. Iran is in the news and generally not viewed positively. Iran is not just a government, but also people and a culture. 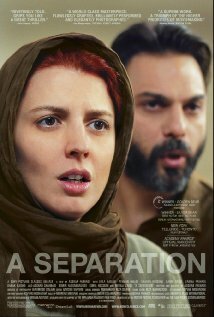 "A Separation" won the Academy Award for best Foreign Film and was declared by Roger Ebert as best film of 2011. A North American can read a lot into the movie finding political meaning, but what I got was that the Iranians are not that much different, while they do have some unique qualities. The focus is ultimately on a couple that have separated over the issue of leaving their country to give their daughter a better future against the husband's need to care for his father who has Alzheimer's. It gets complicated with a miscarriage to a caretaker and the accusation that the husband caused it. There is a bit of a mystery, but more importantly there is a clash between classes and tension within two marriages involving children. And the real mystery at the very end. Most of the film takes place indoors with settings not all that strange to our North American sensibilities. Traffic looks familiar. Well worth watching. "Persian Fire" by Tom Holland was recommended by David Frum. Basically it gets down to East vs West at a critical time when the world could have developed in a much different way than it did. The focus is on the Greeks, but the author does explain a lot of Persian history and culture. I found myself checking Wikipedia to further my understanding. Some of the things I learned included trousers coming from Persian horsemen, a concept of good and evil, the Magi of the New Testament were Persian, the word Paradise is derived from Persia. They were very fond of gardens. We read about the Roman Empire, the British Empire, but are unaware of the Persian Empire. Rayhoon Persian Eatery was brought to my attention through work. I am familiar and attracted to a variety of "ethnic foods" including Italian and Ukrainian through my marriage, Moroccan through my sister, Asian (Indian, Chinese and Thai) through good fortune. I decided it is not fair to sell something I wouldn't buy, so I bought myself a visit to Rayhoon's with my wife. We loved it. 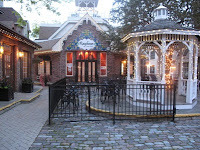 Great service, great food. Fortunately we had very helpful advice from a waitress that gave us good choices. She was right, their ice cream is different and I am glad I tried it. If you live anywhere near Burlington Ontario you should check out their website www.rayhooneatery.com/ Make sure you check the reviews as they will help you order.